PLEASE NOTE: This article is part of a rundown of Marvel's upcoming movies. For an explanation and links to all the other upcoming movies please click here. 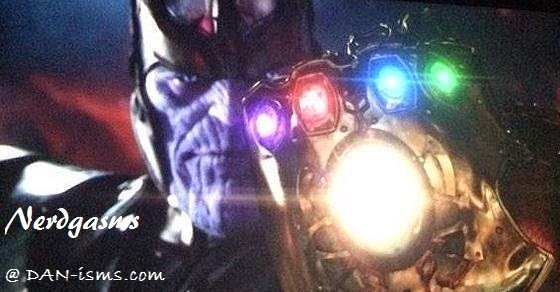 The Infinity Gauntlet was designed to hold the "Soul Gems" or Infinity Gems (called Infinity Stones in the movies,) that give the wielder god-like powers over the entire universe. Created by Thanos the Mad Titan so that he could win Death's affection by wiping out all life in the galaxy. So far we've only seen four of the six gems in the movies but it's an obviously good bet that the rest will follow shortly. Time Gem: Total control over all aspects of time including time travel, stopping time, slowing down or speed up flow of time and to accelerate or slow down aging. Space Gem: Limitless manipulation of space, allowing for teleportation, dimensional manipulation, creation of wormholes, etc. Soul Gem: Limitless manipulation of souls both alive and dead also has shown to be able to evolve or devolve a beings physical self as well as their mental capacities. Reality Gem: Locally or universally alters the natural laws of the universe to the wielder's will. Power Gem: Controls all of the power in the universe. It can be used to augment or inhibit any force. Mind Gem: Taps the user into the universal consciousness, allowing for unlimited manipulation of psionic powers including telepathy and telekinesis. The ones we've seen in the movies are the Tesseract (Space Stone) in The Avengers/Captain America, the Aether (Unkown) in Thor: The Dark World, the Power Stone in Guardians of the Galaxy, and the Mind Stone in Loki's Scepter from the Avengers. My best guess is that we'll see a stone in both Black Panther's movie and in Captain Marvel as both are back to back movies that lead into the Infinity War. Andrew resides in Virginia Beach,Virginia, within the greatest nation of them all—‘Merica’.